Tradition is defined as “The handing down of a belief, legend, or custom from generation to generation”. The Swingin’ Medallions, a 48-year Southern tradition, are a living definition of the word. How does a band endure the generations? The group’s signature high-energy style delights audiences of all ages. Their act, as well as their music, is indeed timeless. 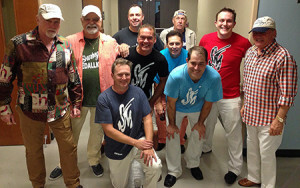 The band was founded in 1962 by John McElrath and now includes his two sons, Shawn and Shane. Featuring an ever-popular horn section, the group effectively blends the sounds and music of yesterday and today. 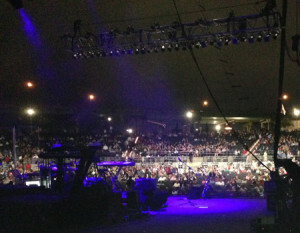 The band has performed throughout the nation in thousands of venues. Their diverse repertoire has made them overwhelming favorites with college audiences as well as the more mature rock and rollers. The band was made famous by its 1.2 million selling hit album, “Double Shot of My Baby’s Love”, in 1966. It remains the signature song of the band. The song, in fact, continues to demonstrate its timeless quality on radio, television and in motion pictures. “Double Shot” was followed they released yet another hit, “Hey, Hey Baby with another hit, “She Drives Me Out of My Mind”, in 1967. In 1969,”, the song featured at their 2004 Gator Bowl Half-Time Show performance. The band released countless other singles through Capitol Records and continues recording new music today. In September 2009, in the midst of his encore at the Bi-Lo Center in Greenville SC, Bruce Springsteen brought the Swingin’ Medallions to the stage! The Swingin’ Medallions joined “The Boss” for a rousing rendition of their 1966 smash hit, “Double Shot of My Baby’s Love,” providing one of the many highlights at Springsteen’s first-ever Upstate SC concert. The Swingin’ Medallions’ surprise appearance intensified the club-like energy that the show offered. Surely, if the thousands of screaming fans who filled the arena had taken a brief moment to close their eyes, they could have easily imagined they were inside a much smaller venue(DAN ARMONAITIS, For the Herald-Journal). In early 2008, they were invited by the United States Ambassador to Canada to perform in Ottawa, Canada for a forthcoming July 4th Celebration. In 2007, they were chosen to headline the Inaugural Party for the Governor of South Carolina, Mark Sanford. Also in 2007, they performed for the Governor of Georgia, Sonny Perdue’s Inaugural Ball. In 2003, they joined forces with Coors Brewing Company, Sterling Marlin and hundreds of fans for a Cruise of the Caribbean. The cast of the hit television series Aly McBeal sang along with the original recording in a 1998 episode. Bruce Willis sang the song in an episode of “Moonlighting”. In 1999, it was again featured in the NBC miniseries, The 60’s. It was heard on the big screen in the movie, Sorority Boys and most recently it was used in the NBC series, American Dreams. Bruce Springsteen labeled it “The greatest fraternity rock song of all time” and has played the song in his concerts. The new book, “Heeey Baby Days of Beach Music”, was officially released October 6, 2006 at the Georgia Music Hall of Fame in Macon, Georgia. It is a comprehensive history of the Southeastern Music Scene of the 1960’s. It is 552 pages long with over 800 images and weighs over 10 pounds! This book features the story of the Swingin’ Medallions! Visit www.heybabydays.com for more information.